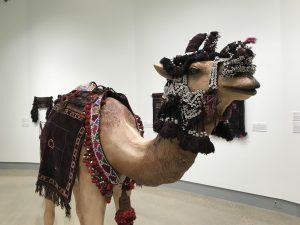 In Hope College’s Kruizenga Art Museum, a current exhibit asks an unapologetic and perhaps overwhelming question: What exactly is art? Is art aesthetically-pleasing work meant to only be seen and not touched? Must it hang on a wall or stand on a pedestal? Or, can art be practical, painstakingly-created pieces made for everyday use? “Once Were Nomads,” on display through May 11, begs reflection on those questions. And here’s a spoiler alert: A life-size, fiberglass camel stands at the center of the exhibit offering insights toward some answers. 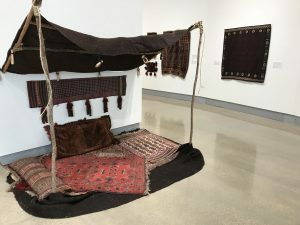 The scholarly, collective and lengthy work of Charles Mason, Dr. Debra Swanson and junior art major Caleigh White during the summer of 2018 resulted in the winter showcase of “Once Were Nomads.” The exhibit invites viewers to look at the everyday, artistic textiles of the Baluch people, a nomadic tribe from Baluchistan — an area that straddles the modern-day borders of Afghanistan, Pakistan and Iran — and consider an expanded, moving reality of art. 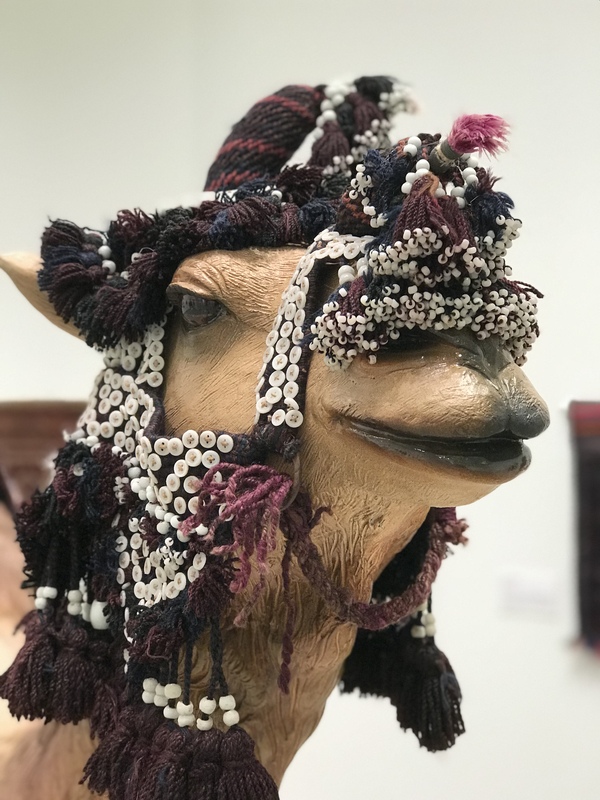 The harsh, Middle East region of the Baluch people is where those artisans create beautiful works of art that are constantly on the go. 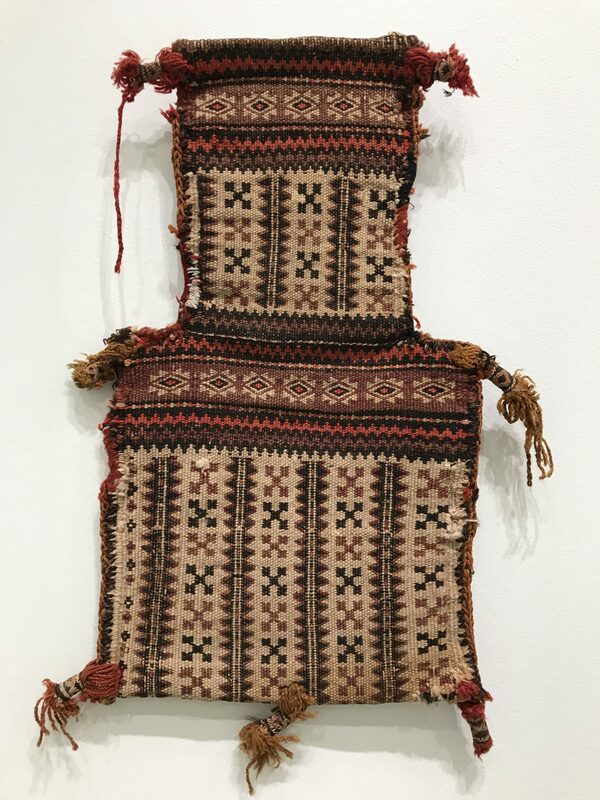 Featured in “Once Were Nomads,” domestic items like a bag used for salt storage, or rugs made for sitting or mealtime or praying, or a camel’s “dress” for a wedding ceremony allow museum-goers to marvel at the Baluch’s ongoing creativity and effort. 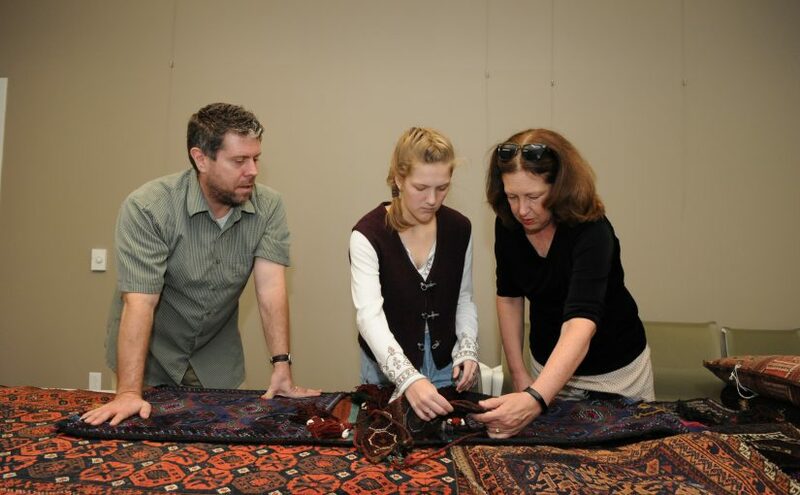 “In Western cultures, we tend to think of art as being painting and drawing and sculpture and photography, but in many cultures of the world, art is literally woven into the fabric of everyday life,” says Mason, the Margaret Feldmann Kruizenga curator of the KAM. 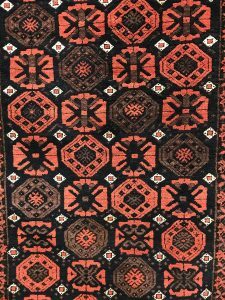 For centuries prior to this one, the Baluch had depended upon various lightweight textiles (lighter than wooden furniture anyway) to sustain and create their households as they moved their flocks of sheep and goats freely within the region. Since the beginning of the 21st century, political and economic pressures have limited that movement and now many Baluch people are confined to “reservations” in Baluchistan. Their original ways of life have been threatened, and it turns out, scholars do not know that much about them. 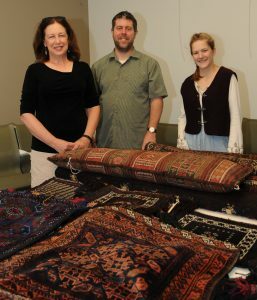 The Baluch pieces featured in the KAM were donated or loaned to the college thanks to Mason’s friendship with and request to art collectors, Verne and Paula Trinoskey of Eureka, California. White applied for and was awarded a Borgeson grant to begin work with Swanson on the project during the summer of 2018 and in the fall of 2018, White also applied for and was awarded a Dryfhout internship to finish the exhibit with Mason. 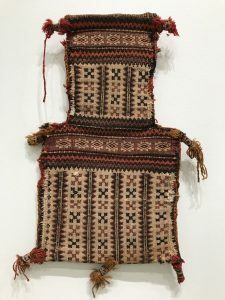 A summer trip to Washington, DC and the Textile Museum at George Washington University, as well as at the Smithsonian, helped Swanson and White see how other museums produce anthropological art exhibits. 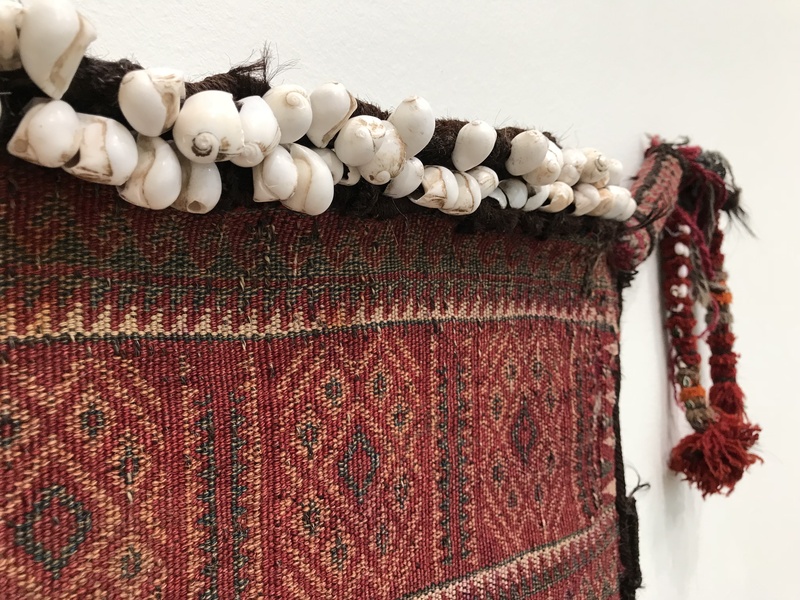 Once back at Hope, the three went about the work of figuring out how the art exhibit in the KAM would tell the anthropological story of the Baluch people. White was especially instrumental in researching more about the Baluch way of life to present on interpretative plaques as well as a 15-minute video that shows more than words can tell about how the textiles fit into the Baluch culture. “We knew we had to ask and reflect on questions like, What is nomadism? What is the Baluchistan landscape like? The geography of the desert or valley? How do they live? Why do they create such beautiful things?” reflects White. “They have a ground-level lifestyle, and they make it comfortable for themselves through the use of textiles. Amazing textiles. 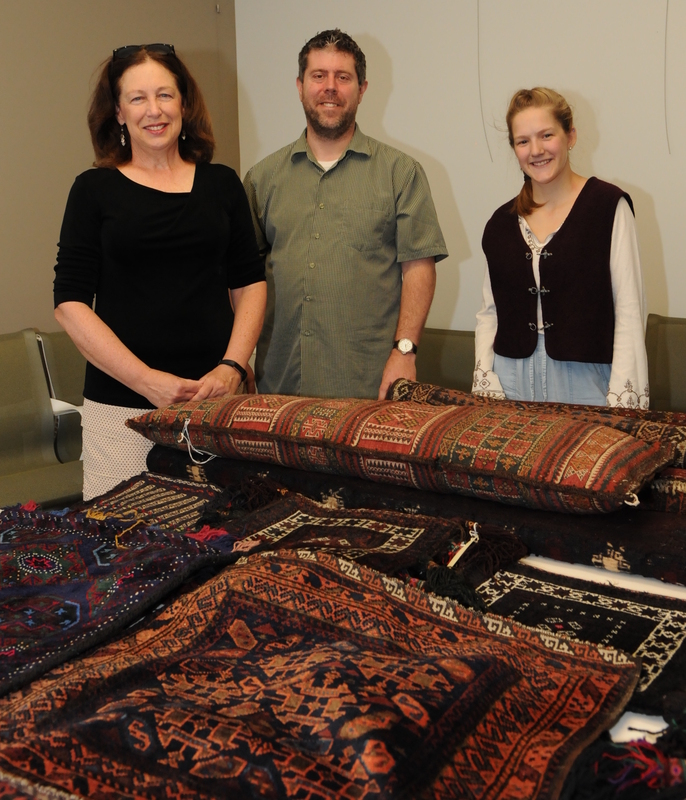 Baluch textiles filled the KAM conference room last summer before filling the KAM walls this winter. Mason and White would carefully select and consider how every piece could be displayed. 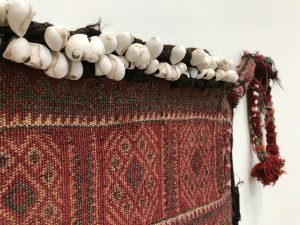 Flat items like rugs and bags and clothing could easily hang on walls, but how would they display the loopy, floppy essence of the ceremonial animal trappings? That’s where the KAM-el (get it?!) comes in. And it looks pretty good all dressed up with no place to go. For now anyway. 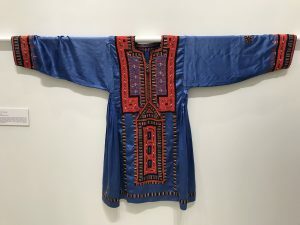 Eventually, Mason would love to see KAM-el in the Van Wylen Library or the Schaap Science Center or any other academic location where it can easily display its fine-fitting Baluch art. Whenever and wherever it does, KAM-el will continue to educate and remind the Hope community about the definition of art for people who once were nomads. 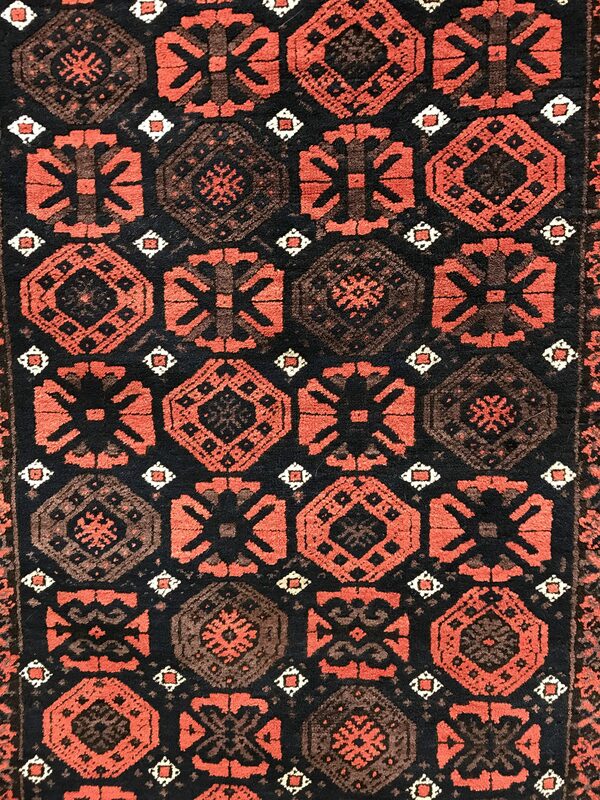 Pile rug close-up with stylized floral lattice design. Wool. Late 19th C.
Vanity bag. Wool. Early 20th C.
Grain bag. Wool, goat hair, shells. Early 20th C.
President Woodrow Wilson proclaimed it a national holiday in 1914, and it didn’t take long thereafter for Hallmark Cards to make it a national celebration. Today, Mother’s Day is the third-leading retail holiday in the country, according to the National Retail Federation. Consumers will spend close to $24 billion on flowers, cards, jewelry and other bric-a-brac to celebrate motherhood this May. For one Hope College professor though, acknowledgment of the sacrificial nature and special identity of mothers goes far beyond matriarchal tchotchkes and trinkets. 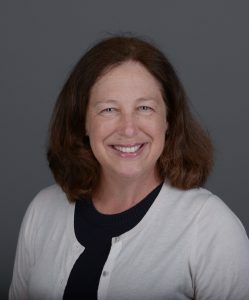 Influenced by her own spirited maternal role models, and after becoming a mother herself, Dr. Deb Swanson, professor of sociology, delved into how women define good mothering practices in their roles as either stay-at-home or working moms. What she found was not completely unexpected. Her work has shed more light on the complicated nature of motherhood in 21st century America where 70 percent of mothers with children under 18 participate in the labor force,75 percent of whom are employed full-time outside the home,according to recent U.S. Department of Labor stats. Swanson’s work also confirms this: Motherhood is not for wimps. Swanson’s research sheds more light on the complicated nature of motherhood in 21st-century America where 70 percent of mothers with children under 18 participate in the labor force, with over 75 percent employed full-time, according to recent U.S. Department of Labor stats. Inspired by strong women in her family — one great-grandmother who was the rare female high school graduate in the early 1900s in Iowa, another great-grandma who was the first woman to secure her own bank account in Corning, Iowa, and her own mother who was discriminated against while applying for a nursing job because she was pregnant in the 1960s — Swanson became even more fascinated about the changing identities and roles of working mothers when she became a working mom herself. Along with colleague Dr. Dede Johnston from Hope’s Department of Communication, Swanson interviewed 100 women in the Holland area about their definitions on being a good mom, where they found support, and how children changed their identity. The women who participated in the study were employed full-time outside the home, worked part-time outside the home, or were stay-at-home moms. Stay-at-home moms felt a strong moral imperative to stay at home, were sure about what they did and why they did it, but they were lonely. They missed adult interaction. 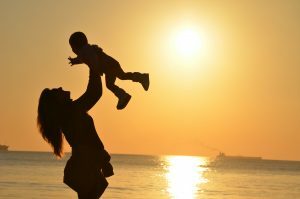 While clear roles and expectations, along with loneliness, existed for mothers in the first two groups, assumptive and nebulous expectations clouded mothers’ identities and joy in the third. What did these outcomes tell Swanson then? What is the take-away here? That may be the best Mother’s Day gift for all. 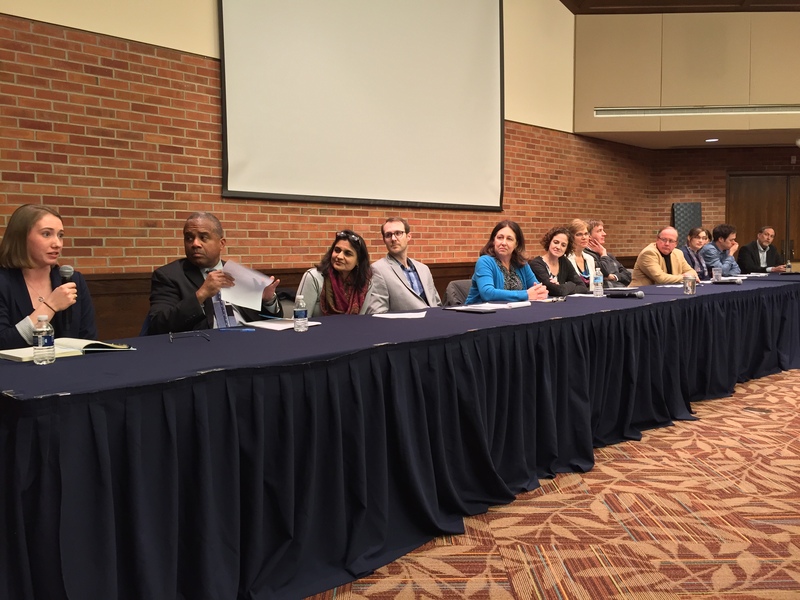 This past Monday night in Maas Auditorium, 13 bottles of water sat on a long table, each provided for one of the 13 people preparing to speak on an interdisciplinary panel about the Flint water crisis. One container of water, though, was not being consumed, nor would it be. Displayed at the center of the dais, a mason jar filled with water from Flint, Michigan, looking as benign and similar as the water in the other 13 bottles, was about to be examined from political, sociological, psychological, historical, scientific, artistic, ethical, and personal perspectives. Though the water in the jar appeared clear, the water crisis and its fallout and solution can seem anything but that. Though the water in the jar appeared clear, the water crisis and its fallout and solution can seem anything but that. Organized and implemented by Dr. Julie Kipp’s women’s and gender studies keystone class, the event gave an opportunity for a large audience to consider what has happened in Flint as well as providing a challenge for all to get involved and do something appropriate within their discipline or interest. The panel, made up of one student, 11 professors, and one president, discussed the very tragic, sometimes complex, and always upsetting issues revolving around the high levels of lead in Flint water and those who drank that water for over a year. Delivering their expertise from their various points of view within a five-minute time limit each, the panel continued to cast light upon light upon light onto a problem that has fallen out of the nation’s glare… for the time being anyway. This communal time of reflection also gave hope for understanding next steps in Flint. Katlyn Koegel, far left, speaks as part of the 13-member Flint Water Crisis panel. Historically speaking, Dr. Fred Johnson, declared that Flint has its proud roots in Native American origins and the founding of a General Motors plant there in 1908. “And many of you may know, it was the site of the 1936-37 GM sit-down strike which basically brought the UAW (United Auto Workers) to prominence, making it a major instrument in the labor movement.” Now, the city’s heritage is being viewed only through a microscope created by this recent history. 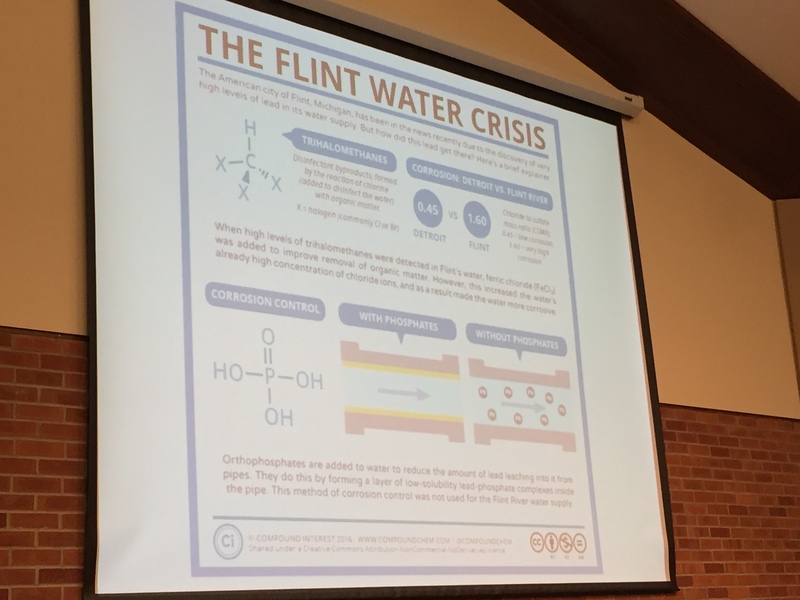 Sociologically speaking, Dr. Aaron Franken and Dr. Debra Swanson showed that race and socio-economic status are key to making sense of what is happening in Flint. “When looking at kids in Flint, here’s some points that are important and highlight social processes for health: One, if socio-economic status is linked to health, and two, decreased educational attainment is a key link to lower socio-economic status, and three, lead poisoning manifests itself in behavioral changes and in cognitive ability changes and thus a link to decreased educational attainment, and, four, sizable portions of residents (in Flint) don’t leave the area – so residential non-migration – then we’re going to have a potential geographic health issue with a very long memory in Flint,” said Franzen. In 2013, the median household income in Flint was about half of that than in the rest of the state. The state median income is $43,000; in Flint it is about $23,000. Approximately 22% have a household income of less than $10,000 a year. Forty-one percent of those living in Flint are below the poverty line, 56% of the population is black, and 75% of the households are single-parent homes. “This is a demographic of poor, black moms with kids who get no political attention,” says Swanson. And yet those women have organized protests at the state capitol in Lansing as well as a movement with Lead Safe America Foundation, bringing attention to the crisis on Twitter with over three million tweets in two hours on February 4, using the hashtag, #StandWithFlint. From an artistic standpoint, Rob Kenagy and Dr. Katherine Sullivan revealed how art and activism is giving people a news lens through which to view Flint. “The slam poetry coming out of Flint is hot…It’s important to remember that that art is made by real people,” said Kenagy, “and it’s just not something you can click past. There is a real voice behind it. We as readers have a responsibility (to hear it and see it), especially those of us from privileged spaces. We have to actually accept the trauma and invite it into our lives. We have to listen. We have to let our neighbors (in Flint) know that we’re here, not to own or claim the crisis as our own but rather to try to understand it.” Poetry and art is yet another way to do just that.